Update: In January, 2012, Lil’ Vinny’s closed. I love organizing events. Weddings, showers, birthday parties, teas, work events, anything! If some one even mentions an event I usually can’t even stop my mouth from volunteering to take on the project. But it makes me happy. And when the events I am organizing circle around food…even better! So when I spoke with Lil Vinny’s Ristorante about hosting a bloggers dinner, that old happy feeling headed right to my belly! Nothing makes me happier than finding new hidden gems that don’t have a main stream following. The type of place you can recommend knowing it will be delicious every time and that no one else would have suggested it yet. Lil Vinny’s will now be on that recommendation list. I don’t know what I was expecting when I walked into Lil Vinny’s, but for some reason the cozy, family restaurant like atmosphere surprised me. As I sat at the table with my 9 fellow bloggers, the atmosphere really lent itself to us completely relaxing and surrendering to the fabulous food and good conversation. From the second I tasted the garlic infused oil for dipping bread, I knew we were in for a treat. The first course came, and the food never stopped flowing after that. 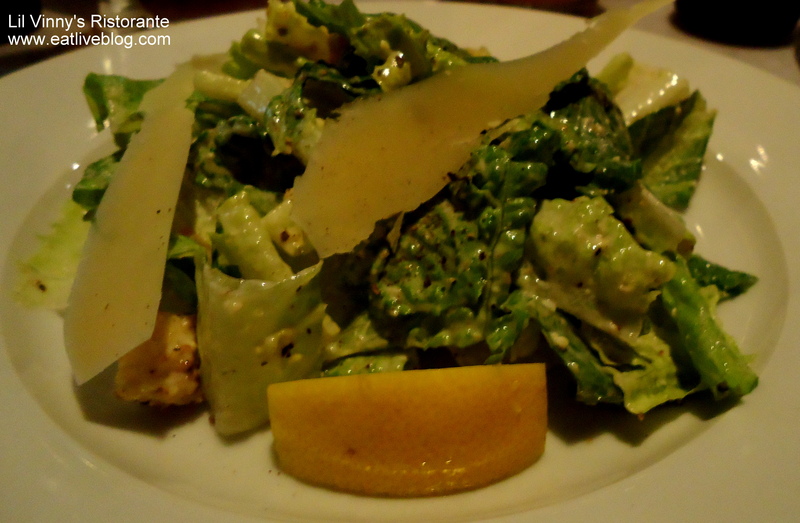 Cesar salad was up first, and something I usually pass up. But the giant slices of parmesan luckily pulled me in. I was rewarded with a lovely lemony tang, and crispy, fresh croutons. 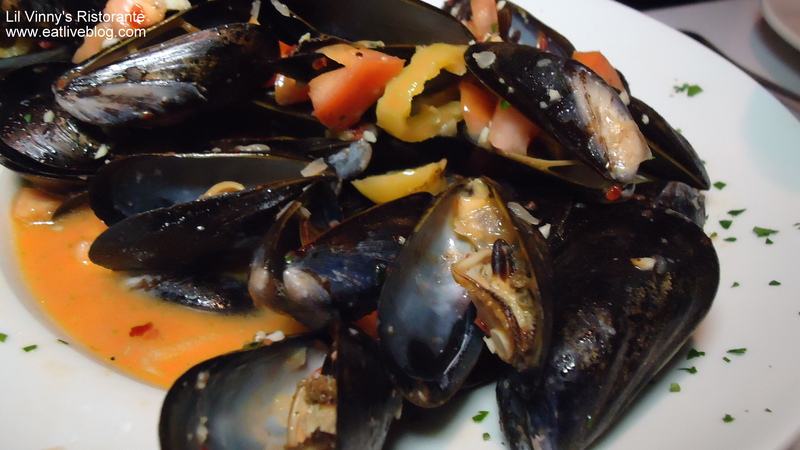 And then came the mussels….and the broth that embraced the mussels. I am not embarrassed to admit I literally DRANK this salty, spicy, perfectly balanced broth. I was also quite impressed that the waitress knew what was in the broth! After the mussels disappeared (which was VERY quickly), the pasta started to appear. 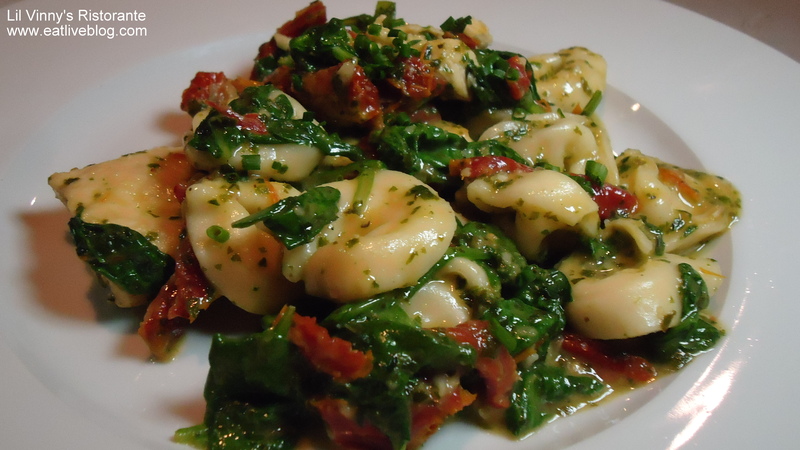 First up was three cheese tortellini with sautéed chicken breast, spinach and sundried tomatoes with homemade pesto. The pesto was eat-with-a-spoon worthy. However, the tortellini and chicken didn’t wow me. They were good enough, just not as amazing as everything else so far. At this point I had to slow down, lest my belly was to burst. As much as I wanted to sop up all of that pesto with bread. I had to give up half way through this dish. And then I saw it…the stuffed eggplant. Now THIS was something special, and I don’t even eat eggplant! I tried to stop half way through, but ended up demolishing this whole dish. Eating the whole eggplant was a bad move, because next the waitress brought out the most beautiful bowl of homemade Fusilli Bolognese. 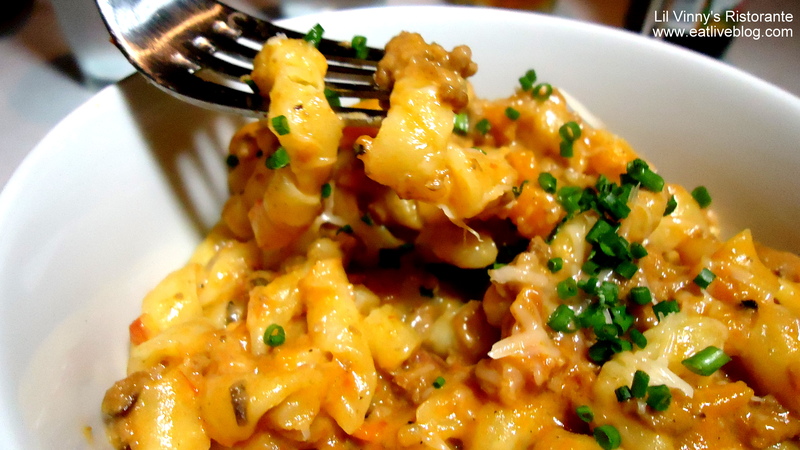 The pasta melted in my mouth. The sauce danced on my tongue. And every other food cliché you can think of. Unfortunately, my stomach STRONGLY recommended I not put anything else in it, so I only ate a little of this dish. Luckily this ment leftovers for the next day! But wait, there’s more! 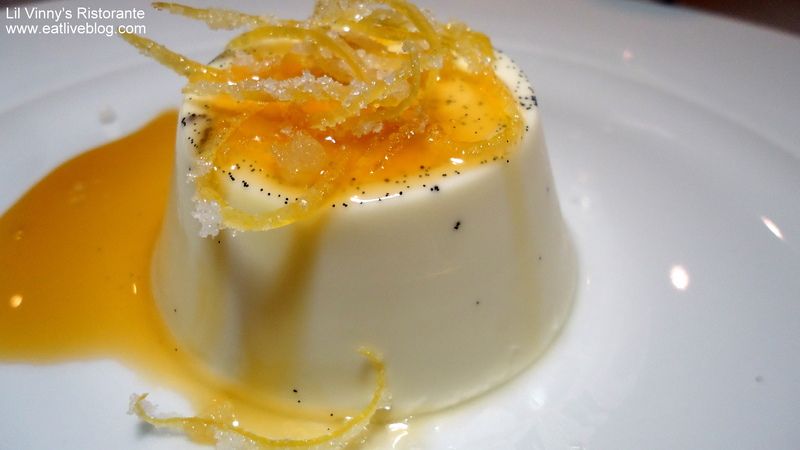 We were next presented with a Vanilla Bean Panna Cotte with Candied Lemon Zest. Look at those vanilla beans!!! This was SO good. I even commented that Panna Cotte is perfect dessert since it is so light there is always room for it. Wrong. There was no room left for this light and smooth delight. However, my fellow bloggers took care of that for me no problem! Lil Vinny’s was such a surprising evening. If I were the Phantom Gourmet, it would definitely be awarded my Hidden Gem! I cannot wait until the next time I have guests in town so I can treat them to a fabulous, relaxed evening of absolute delicious home cooking! Disclaimer: Dinner and drinks were generously provided free of charge to our group. All opinions and descriptions are my own. This may not be representative of a “normal” meal. 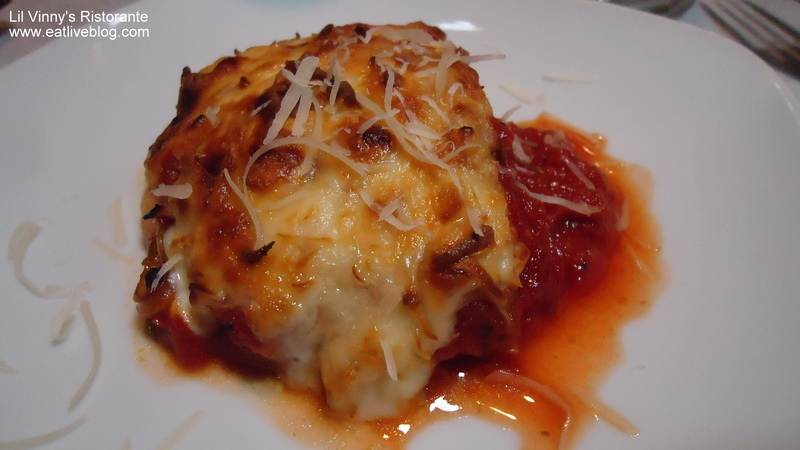 This entry was posted in Reviews and tagged blog, boston, eggplant, fusili, hidden gem, home cooked, italian, lil vinny's, muscles, restaurant, review, somerville, tortellini by reneeh. Bookmark the permalink. Looks like an awesome evening of eating! I love Italian food, and this isn’t too far from me, so I’ll have to add it to the list of places to check out! The mussels were insane! By far the best I have ever had. I would go back specifically for them! Such a fabulous dinner! I wish I could have more of that bolognese!